What could be more perfect for a gorgeous saturday post? 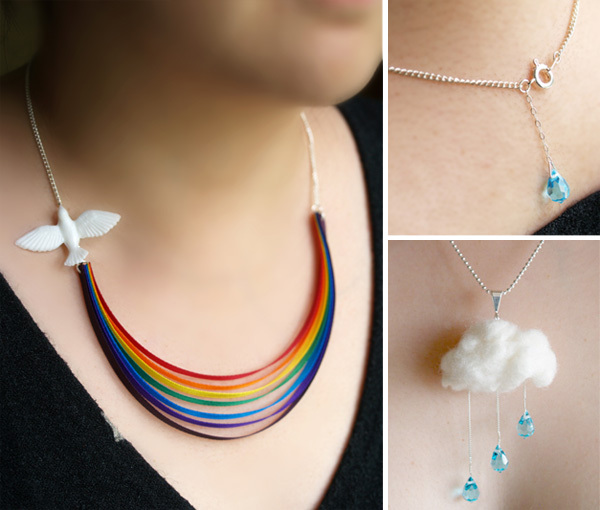 Mixko first gave us the rain cloudy English Summer Necklace… and freshly launched is the Here Comes The Sun Necklace (are you hearing the beatles in your head already? Or is that just me? )… “7 layers of ribbon rainbow and the last drop of rain on your back. Silver plated findings and chain, czech crystal bead, polyester ribbons, plastic dove object.” SO pretty, so simple, and i don’t think you can help but smile when you see it… their concepts are always so elegant as well… AND, they even have an etsy store for easier shopping for the americans… see more pics of it on the next page! The whole Cell Cycle Collection is quite mesmerizing! Take a peek at close ups of my bracelet as well as a look at the full collection and the story behind it on the next page! WEJETSET + Mr & Mrs Smith Giveaway! 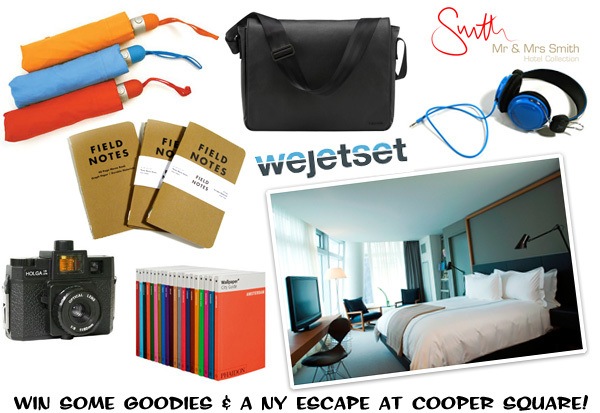 When my friends over at WEJETSET and Mr & Mrs Smith reached out and asked me to share a chance to win some goodies, i couldn’t resist when they were giving away so many NOTCOT favorites… You know you’re way overdue for some R&R ~ possibly with someone of your choice curled up in the lush bed over at Cooper Square Hotel in East Village, NYC… while rocking out in electric blue headphones and doodling in your field notes and snapping pics of whatever silliness the others in the room are up to… ok, maybe that’s just what i wish i were doing right now? But none the less ~ i’m sure you’d enjoy the fantasy too…. and it even comes with $400 of spending cash (or travel cash or whatever you’d like to do with it? )… SO, happy wednesday, and go ENTER HERE! On inspirational spaces ~ and that very odd feeling of wishing i had a huge office filled with creatives to hang out and play with (not that you kids here on the internet aren’t fun!) ~ who knew that answering a random email/twitter would lead to having such an inspiring lunch over at TBWA\Chiat\Day, and getting a chance to explore their VERY fun office space over in Playa Del Rey? 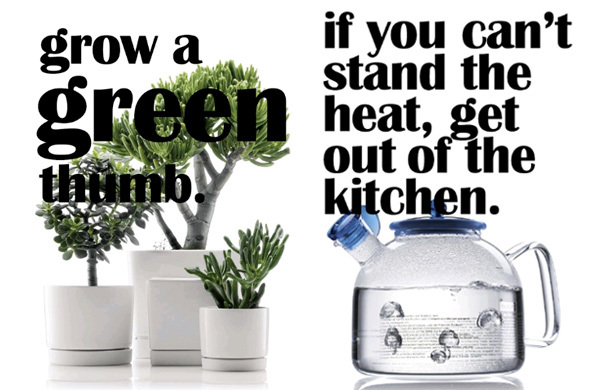 I suddenly have the hankering to break out the vinyl cutter and fill unexpected spots with giant quotes… play with designing guest stickers (for people entering the house/office??? )… spray painting giant logos out on the floor of the patio… build a BAR out of surfboards… and so much more silliness… It was really incredible to be in a place that so clearly prioritized creativity and the generation of fun ideas. Don’t get me wrong, i’ve always loved advertising, and i REALLY love the visual and innovative sides… but recently as i’ve learned about advertising on the web, i’ve gotten to see the less fun side of it (negotiations, accounts, ideas that get devolved until unrecognizable - as well as incredible ones of course! 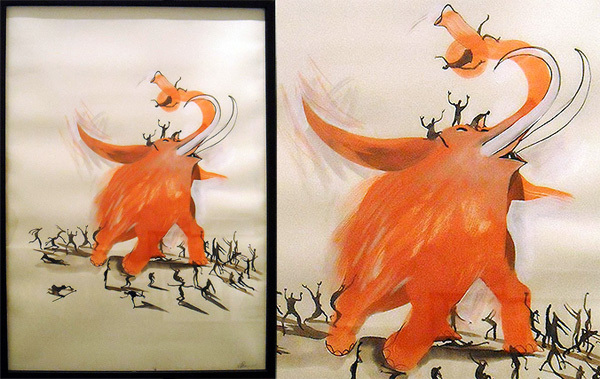 )… I guess you could say it was fun to have that moment of “ooooh so THIS is where my crazy campaigns and banner ads come from”… and just so nice to connect with real people behind the artwork, ideas, and campaigns. 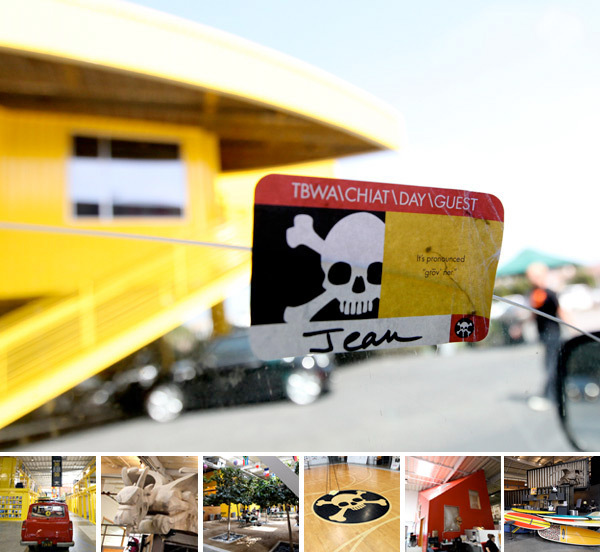 SO ~ take a peek inside TBWA\Chiat\Day, the incredible land of ad legend, Lee Clow… tons of pics on the next page! p.s. Huge thanks to all the TBWA\Chiat\Day-ers who knew NOTCOT ~ it’s such an honor to hear the sites help keep you inspired! And i’m not kidding about being curious to see what else you find out there that i miss! 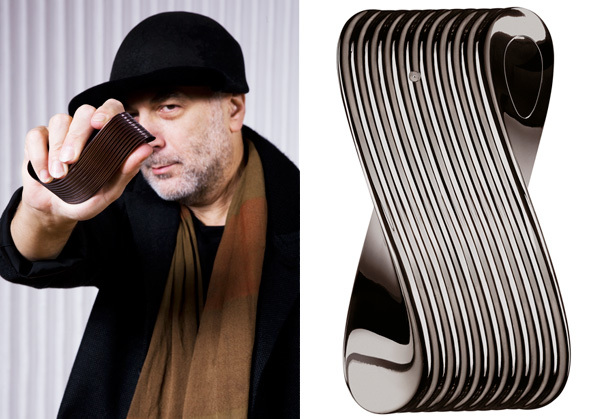 I never thought i’d wake up this morning, and end up buying Yves Behar designed underwear… but i’m too curious. And the photography is just so adorably happy. And a portion goes to a good cause (or three! )… freshly launched today is PACT - the brain child of entrepreneurs, Jason Kibbey & Jeff Denby. Also, i doesn’t hurt that for the most part i like how clean and refreshing their site is! As for the options: three colors, three causes, and three cuts for men and women… whether you want solids or the adorable patterns… you can pick to support 826 International, ForestEthics, or Oceana. All great causes, and all patterns/colors/fits look great. My pens got envious as soon as i opened the latest email from the folks at Merchant 4 ~ their new Place For Trace ~ pen/pencil and tracing paper roll holder… so pretty, so simple… it makes me want to drill holes along the edge of my desk to line up all my pens/markers/pencils… i suppose it would end up like a colorful picket fence of writing instruments (and maybe x-actos too?) around my laptop and such? 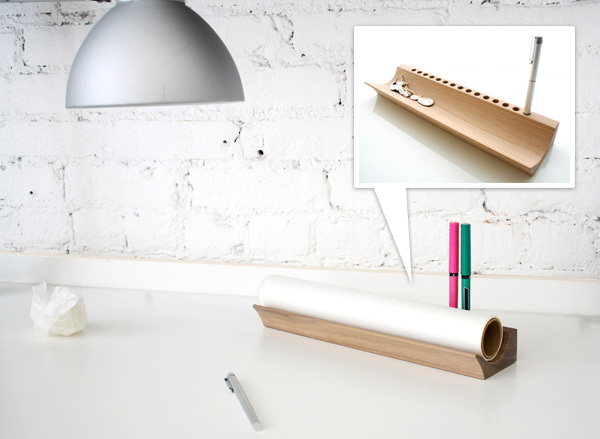 Anyhow, take a peek at this new desk accessory on the next page! afterthought: i wonder if these holes fit sharpies? Beauty in Technology post series sponsored by Samsung’s new LED TVs! 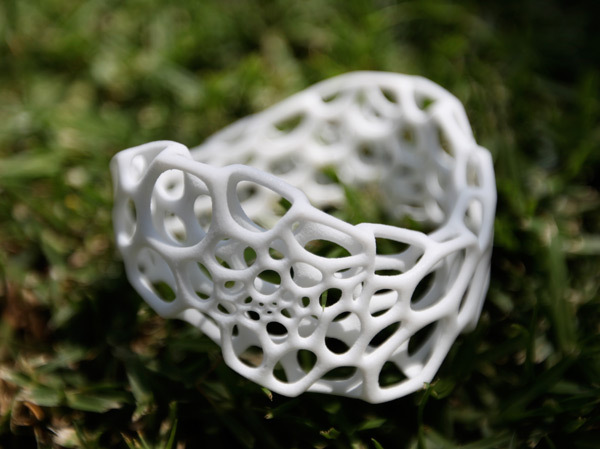 Post #4 of 6 in this series exploring random beauty in technology, NOTCOT style. 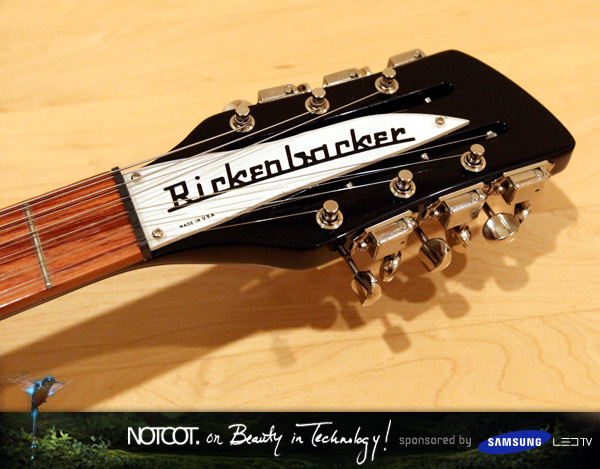 It’s been such a fun challenge finding things to share for this Samsung sponsored post series ~ running around my life finding unexpected inspiring beautiful tech details i may not have normally noticed or thought about that are in my every day life… today i’m excited to share the Rickenbacker 350/12V63 Liverpool 12 string electric guitar with you! (Also awesome? The color is called “Jet Glow”) John Lennon, The Byrds, and Tom Petty were all known to play Rickenbacker… and really what grabbed me was the way the tuning machines are attached to the head without looking too crammed, even when there are twice as many as usual! And really it’s just such a stunningly gorgeous machine ~ check out the pics on the next page! There’s something so fun about the juxtaposition of animation running around the real world ~ adorable campaign by the Swedish Tourism board aimed at brits - Dave Goes To Skåne. When i first saw this over at CPLuv i had to go watch them all! Dave is a cheeky cartoon londoner running around mouthing off in some gorgeous swedish spots ~ and you cant help but laugh, then wish you too were lying on the beach, or climbing about designer goodness in the woods… see the 4 videos on the next page! 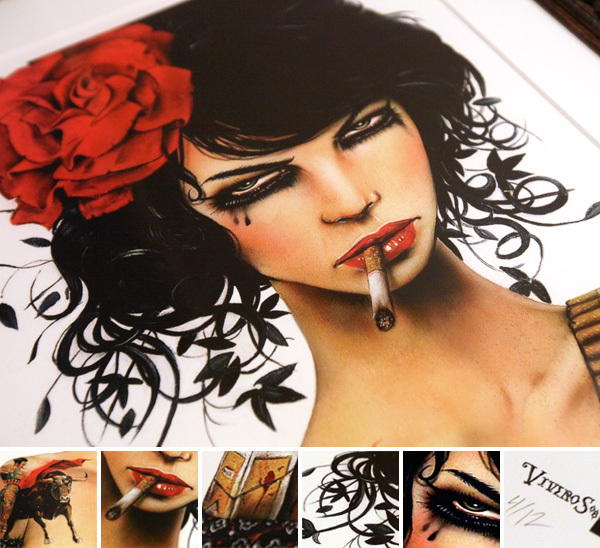 I always look forward to goodies from Artecnica ~ so much good stuff ~ and good for the world too! As part of their Design w/ Conscience initiative ~ TBWA (yes the advertising agency massive) approached them to help recycle their billboards… their solution? these adorably inspired Stretch Bags! 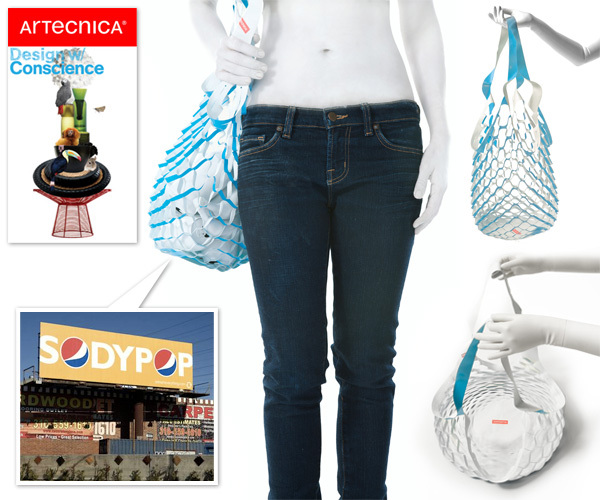 I have written about a LOT of recycled bags over the years ~ everything from truck tarps to windbreakers to fire hoses to gymnastics horses… but it’s been a while since one has been innovative enough to grab my attention like this one! The Artecnica TBWA Recycled Billboard Stretch Bag is debuting this month and is part of the newest 2009 collection - “A single cut, without glue or a stitch, 100% billboard bag lies flat and weightless but transforms into a shoulder Stretch bag, that can carry up to 33lbs. Perfect for the beach, the gym or market.” See more pics on the next page! Packaging based impulse shopping strikes again… This time i gave in and bought the Neurogasm, Neurobliss, Neurosonic, and Neurotrim. This strangely curvy soda bottle has an awesome cap, yet for some reason it kind of feels like it should be a bottle of body wash? Not sure about the flavors yet, but noteworthy packaging… see more details on the next page! 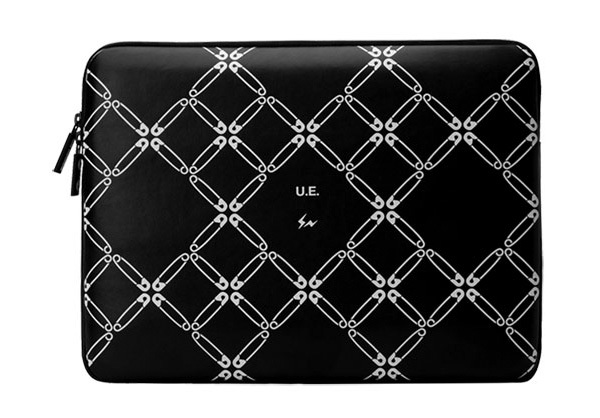 Does this laptop sleeve not scream NotCouture to you? I was so excited when i saw it! Incase teamed up with Honeyee and japanese uniform experiment…. to create this beautifully simple monochromatic uniform experiment sleeve… and you regulars definitely know how we love our safety pins over at NotCouture ~ especially clean vectorized ones! Honestly, i only wish they took it a little too far and made the zipper pulls safety pins with the majority of it dipped in clear rubber, so it looked like you had safety pin pulls! Or at least safety pin graphic on the pull? Also… love that it is lined with the awesome feeling, yet distracting named “faux fur” ~ which really feels far better than it sounds. Take a look at more pics on the next page!